I’m a Star Alliance flyer for about 99% of my trips. It can get you almost anywhere in the world quickly and easily, but not DEN to LAX on a Wednesday after 9pm. The only option was Frontier, so I joined a new frequent flyer program, booked my ticket, and broke my flying routine. I’ve been interested in Frontier since they (Republic Airways really) took over Midwest Express a few years ago. Republic is a successful operator of regional jets for mainline carriers. It’s a nice business model as the large airline pays for fuel and has to sell tickets. Express carriers just need to show up with a plane and crew to collect a flat fee per flight. A few years ago, Republic’s management decided to run branded service and purchased Frontier out of bankruptcy. Soon after, they bought Midwest Airlines in bankruptcy too. This isn’t proving to be the best business decision as Frontier loses as much money as their core business line makes. Frontier has a large operation in Denver and is serious competition to United and Southwest at DEN; helping keep fares down. They also have different animal pictures on their aircraft, so it makes for fun plane watching too. I had never traveled with them before and didn’t know anything about flying with them. My travel experience with Frontier was pleasant all around. There were no lines at check in and no window seats on my flight. 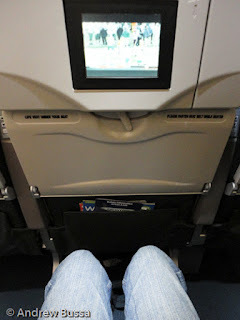 Frontier sells their equivalent of Economy Plus called stretch seating; it provides a few more inches of leg room and seat up front, but I declined the upsell. If you don’t buy a stretch seat, select row 20 or higher, those are the first rows called in general boarding. The boarding process could have been done better because there was no general explanation of the process before it started, so everyone gathered around thinking they could be next. The gate agent made one announcement per group and had to turn many people away because they didn’t hear the single announcement. Frequent use of the PA would be a simple solution to a frustrating situation. The aircraft was a new A320 and spotless inside. It had LED lighting and the new slim style seats. I sat in seat 20B, a middle seat, but with enough space for the two hour flight. There are seat back TVs available for a fee, unlike JetBlue’s free DirecTV offering. The flight attendants came through with a drink offering and baked onboard chocolate chip cookies, the lasting legacy of Midwest Express. The flight arrived on time and I enjoyed my first Frontier flight. I don’t think I will become a regular, the EarlyReturns program is very weak, but will defiantly consider them for future travel. I am flying from Las Vegas to Denver in April. I already have my tickets. Since I will probably fly at least twice a year, how do I sign up for frequent flyers' points? Thanks for any help you can give. You can sign up here: http://www.frontierairlines.com/frequent-flyers/join then go to My Flights from the home page, enter your reservation code, and add your member number to the passenger information. Thanks for reading and happy travels!